More than just an afternoon of basketball games and block parties, Hoops in the Hood has become a way to instill invaluable lessons to children living in neighborhoods with the most hard-hitting gang-related violence. “This is the most fundamental neighborhood engagement you can get,” said Jaime deLeon of Enlace Chicago, member of Hoops leagues since 2006. What began six summers ago, Hoops in the Hood, a basketball league based on a program that began as a response to gang violence, has grown to encompass 11 communities throughout the city of Chicago. 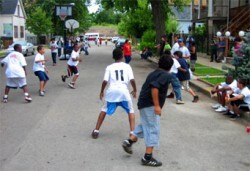 Each summer, residents block off streets and set up hoops for residents to watch young people play basketball and be supervised by coaches and mentors. On Friday, July 20 Hoops in the Hood traveled to Little Village to bring local leaders, elected officials, former Chicago Bulls players, and parents together to form a united stance against street violence. “You can feel a tremendous sense of community. It’s a beautiful feeling to see kids playing on their own streets without any fear or worry,” stated DeLeon. Not only does Hoops in the Hood promote community safety and solidarity, the program also hosts weekly community art projects, health awareness education, and violence prevention workshops. This summer, youth and families from Albany Park, Back of the Yards, East Garfield Park, Englewood, Humboldt Park, Little Village, Near North, Near West Side, North Lawndale, Pilsen, Quad Communities and South Chicago organized street games with a new twist. This year, games were played not only among neighborhood teams, but also visiting teams to encourage cross-city unity. The league’s season will end on August 18th when teams compete for the title of cross-city champion at the Hoops in the Hood sixth annual Cross-City Tournament in Seward Park. The Hoops in the Hood program, originally created by community-based organizations and supported by Local Initiatives Support Corporation Chicago and State Farm, gives young athletes a chance to celebrate their talents while learning about civic duty with their friends and family. To learn more about Hoops in the Hood, www.neighborhoodsportschicago.org.